We’d love your help. Let us know what’s wrong with this preview of Dreadnought by Cherie Priest. Mercy Lynch is working at a war hospital in Richmond, Virginia, when she learns that her husband has died in a POW camp and her estranged father is gravely injured and wishes to see her. With no good reason to stay in Virginia, Mercy sets out to see her father in Seattle. But crossing the country is no small task; it's a harrowing adventure through war-torn border states by Mercy Lynch is working at a war hospital in Richmond, Virginia, when she learns that her husband has died in a POW camp and her estranged father is gravely injured and wishes to see her. With no good reason to stay in Virginia, Mercy sets out to see her father in Seattle. But crossing the country is no small task; it's a harrowing adventure through war-torn border states by dirigible, rail, and the Mississippi River. And once Mercy finally arrives in St. Louis, the only Tacoma-bound train is pulled by a terrifying Union-operated steam engine called the Dreadnought. Lacking options and running out of money, Mercy buys a ticket and climbs aboard. What ought to be a quiet trip turns deadly when the train is beset by bushwackers, then vigorously attacked by a band of Rebel soldiers. The train is moving away from battle lines into the vast, unincorporated west, so Mercy can't imagine why it's meeting such resisitance. Perhaps it has something to do with the mysterious cargo in the second and last train cars? To ask other readers questions about Dreadnought, please sign up. Does this series need to be read in order? Dreadnought looks particularly interesting to me, but I'm not sure that I want to be all in for another series quite right now. Hillary Wilson i would read boneshaker first. I've been told it doesn't matter from there. Boneshaker is very good and an easy read. Dreadnought is amazing. 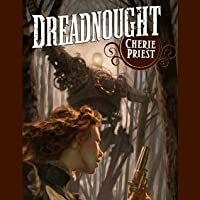 Cherie Priest's Dreadnought is set in the same alternate history as Boneshaker but really doesn't connect with it until the last couple of chapters. It's the story of a Confederate Civil War nurse who receives a letter telling her that her husband, a Union soldier, has died. A couple of days later, she receives a telegram telling her that her father is dying and wants to see her. So, she sets off to travel from Virginia to Tacoma to see him for the first time since she was a little girl. 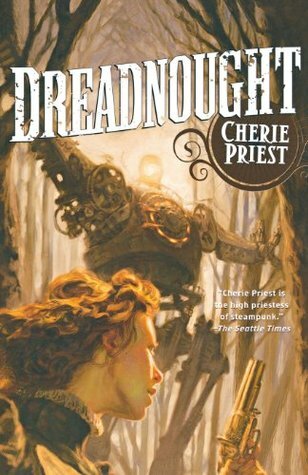 (For so Cherie Priest's Dreadnought is set in the same alternate history as Boneshaker but really doesn't connect with it until the last couple of chapters. It's the story of a Confederate Civil War nurse who receives a letter telling her that her husband, a Union soldier, has died. A couple of days later, she receives a telegram telling her that her father is dying and wants to see her. So, she sets off to travel from Virginia to Tacoma to see him for the first time since she was a little girl. (For some reason, I was confusing Tacoma with Spokane, so I had her traveling to the wrong part of the state.) In this version of American History, the Civil War has raged for more than twenty years and Texas is it's own country. As happens in war, technology rises up to help in the fighting and destruction. Once Mercy sets off for Washington, she faces one danger after another, each worse than the one before. I think Priest made a good choice in choosing a journey to tell this story. It allows her to show what is happening in North America without using a lot of boring exposition. While Boneshaker showed us a microcosm of this world, Dreadnought expands the view to cover the continent. The pacing of this novel is amazing. It starts off slow (for just a short time) and builds to a breakneck speed, mirroring Mercy's journey. I really enjoyed all the action, even the battle scenes. This book would make a great movie. Absolutely amazing! I wasn't sure how this story was going to tie into the story from the first book, but it definitely did. Another strong woman character and the alternate history of Civil War torn America world building continues. Mercy Lynch, a nurse in a Confederate Army hospital finds out her husband is dead and her father is dying on almost the same day. She hasn't seen her father since she was a young girl and he had left, only to disappear "somewhere out west". Contacted by a sheriff in Absolutely amazing! I wasn't sure how this story was going to tie into the story from the first book, but it definitely did. Another strong woman character and the alternate history of Civil War torn America world building continues. It's all about the journey, not the destination, in Priest's third entry in The Clockwork Universe. A journey undertaken via airship, steamship and the eponymous Dreadnought, a monstrous Union war train carry more guns than the Texas chapter of the NRA. It's a journey with more than its fair share of bumps along the way, true, but it's also a very linear one. Throughout the voyage battles are fought, unsurprising mysteries revealed, rebel raiders repelled, numerous secondary characters with hazy motivations encountered, and a horde of zombie heroically disposed of. Because what's a steampunk tale without a healthy dose of zombies? Don't worry, we're sure the werewolves will appear next issue. And throughout all these varied tribulations protagonist Vinita "Mercy" Lynch remains as steady and unflappable as bedrock. Nothing much seems to truly shock the recently widowed Mrs. Lynch, which, unfortunately, means nothing much truly shocks you. Three books seems to be about the amount I need to decide whether or not I'm going to continue to read an author's books, unless they do something right away to piss me off. This is the third Cherie Priest book I've read. Unless something major happens, it's also likely to be the last. I'm just not getting enough out of them, and there are things that nag. Note: The rest of this review has been withdrawn due to the changes in Goodreads policy and enforcement. You can read why I came to this decis Three books seems to be about the amount I need to decide whether or not I'm going to continue to read an author's books, unless they do something right away to piss me off. This is the third Cherie Priest book I've read. Unless something major happens, it's also likely to be the last. I'm just not getting enough out of them, and there are things that nag. So it looks like the backlash against steampunk has finally begun in the last year or two; and to all the haters, all I can say is, "Screw you!" A science-fiction subgenre 150 years in the making, turns out that the punk-influenced genre writers of the 1980s and early '90s found a lot to admire in the old gear-and-steam days of the Victorian Age, especially when a recent reinvestigation into history in those years revealed that humanity came very close to actually inventing computers in the mid-1800s, only that society lacked transistors so couldn't get the machine pieces small enough to do anything practical. And so did these writers combine the finery found in actual 19th-century stories by Jules Verne and HG Wells with a modern sensibility and a "what if" sense of whimsy, producing stories in which giant brass-covered mechanical armed spiders save the day in the Crimean War; and so has this concept grown so explosively fast in popularity in the last twenty years, there are those out there who are actually kind of sick of it by now, and wish that the goggled girls in corsets and top hats would just stay home from this year's local sci-fi convention. But shame on you if you feel this way, I say; because just as others are suckers for moody serial-killer stories, so am I a slavish fan of fanciful Victoriana, and can eat such stuff up with a spoon every day of the week and still want more come Sunday dinner. And man, it doesn't get much better these days than with the work of Cherie Priest, the Seattle-based genre veteran who finally hit major paydirt last year with the nearly perfect Boneshaker (one of my favorite books of the year in 2009, and also one of this year's Hugo nominees for Best Novel), an endlessly inventive book that combines the usual steampunk tropes with a zombie story, a post-apocalyptic one, a first-person-shooter videogame and a John Carpenter movie. Merely part one of an entire coming alt-history series called the "Clockwork Century," through luck and work Priest has gone out and attracted a passionate group of fans, through things like a lively blog and her fangirl love of dressing up for LARP photoshoots; and so has a salivating group of readers been impatiently waiting for volume two of the series, this fall's Dreadnought, making it in good "convention guest of honor" style almost critic-proof, in that it'll be selling well no matter what people like me have to say about it. And indeed, the news is mixed today when it comes to the new book; because as I'm sure even Priest herself knows, when you start a series like this with a title that is so endlessly clever, it's hard to sustain that cleverness through the entire series, with this second story by its very nature being a bit of a letdown just from the aspect of pure premise. See, the first book is about a mad scientist in Seattle who invents a machine for the Russians that can burrow through ice and mine gold up in Alaska, but that causes an earthquake and rupture in Seattle's underbelly when he tries testing it; and this just happens to release a toxic underground gas that turns people into flesh-eating zombies, which the resource-poor territorial government of the Pacific Northwest doesn't know how to deal with, other than to build a giant 200-foot-high wall around the city limits. So now there's an entire basement population of normal humans who live in sealed-off tunnels there -- sometimes to turn this poisonous gas into a slightly less lethal powder that's become the new opium among drug-addicted Civil War soldiers, and sometimes simply because these people are radical libertarians and want to live someplace where the government literally can't tell them what to do; and so do these people fight with each other, fight against the still-alive mad scientist down in the catacombs with them, and are always on the defensive against the zombie hoard above, all within an entire alt-history USA where the Civil War has dragged into a decades-long Vietnam-like stalemate, and where Texas is still its own independent nation as a result. Dreadnought, then, from the aspect of a committed fan like me is a real treat, a story that takes place on the opposite side of the country, using what are only vague rumors in the first volume and making them the main milieu of the second, telling the tale of a Florence-Nightingale-type Confederate nurse right down in the front battle line itself, giving us a firsthand view of all the mechanical monstrosities both sides have invented in this steampunky alt-past; the story itself, then, has our hero "Mercy" learning of a sick father (one of the main characters from the first book) who was long thought dead but instead turned out to be one of these subterranean smugglers in Seattle, which leads Mercy on a series of train and zeppelin rides from the hospital in Tennessee where she works all the way across the unsettled US wastelands, while a whole bunch of stuff happens to her on the way, and where what we know as detailed facts in the first volume turn up as unsettling rumors here (namely, that there's a mysterious substance that may or may not be turning people into flesh-eating zombies, and that there may or may not be a group of several hundred such undead roaming the dunes of the desert Southwest). To a dyed-in-the-wool fan like myself, such a thing is a real delight, two volumes that play an endless game of call-and-response with each other, and that rewards me for being a close reader of both; but to those who aren't natural steampunk fans, this is not one of the exceptions to the genre like the first book but one of the ones that'll make you groan, "What, another of these things?," an unending mishmash of greasy locomotives and and shiny doodads, of people talking funny and concealing futuristic weapons in their frilly petticoats. And that makes Dreadnought in general both what was expected and a slight disappointment; or in other words, mostly just another genre novel, instead of the game-changer that spanks all the other genre novels for being boring little children, exactly like Boneshaker did. And that's why it gets only a limited recommendation today, although I wanted to do a full write-up of it as well, to bring it to the attention of Baker Street Irregulars like me who are sure to love it, a title that like hundreds of other SF titles each year certainly isn't bad at all, but that most likely will not be winning any awards of its own, or get breathlessly commended by Amazon or Cory Doctorow like the first book in the series did. It should all be kept in mind before picking up a copy yourself. Dreadnought is the third book in the Clockwork Century series by Priest. All of the books are separate adventures in the sames universe, so they can be read alone or together. There are five total books planned for this series with the fourth, Ganymede, being released in fall of 2011 and the fifth, Inexplicable, being release in the fall of 2012. This was another great addition to this series; I love the world Priest has created and it was a great read. Mercy is a nurse on the Confederate side of Dreadnought is the third book in the Clockwork Century series by Priest. All of the books are separate adventures in the sames universe, so they can be read alone or together. There are five total books planned for this series with the fourth, Ganymede, being released in fall of 2011 and the fifth, Inexplicable, being release in the fall of 2012. This was another great addition to this series; I love the world Priest has created and it was a great read. Mercy is a nurse on the Confederate side of the war and has just found out that her husband (who fought on the Union side of the war) has died in a POW camp. Immediately after learning this she receives notice that her father (whom she has not seen since she was a little girl) is very sick, is in Seattle, and is requesting her presence. Mercy decides to make the cross-country trip to the west to see her father knowing it will be a long journey. Little does she know her journey will take her through the air by dirigible, through the front-lines of the war, and onto a fabulously dangerous ride on the train Dreadnought. This story is about Mercy's journey and the adventure she goes through to get where she's going. Mercy (like all of Priest's protagonists) is a tough as nails woman who does what she needs to do to get through life. She uses her nursing skills to help those in need and to get herself through tough times. She is a very capable, lovable, and honest protagonist. The characters Mercy meets in her travels are all very human, complex, and interesting to read about. I am always thrilled with how well Priest is able to give life to even small side characters. The world of the Clockwork Century is amazing; you have a world stuck in Civil War long beyond what actually happened, strange steampunk devices created to make life easier (and more dangerous), and a strange zombie-like disease stalking the coasts of the country. It is creative, believable, and absolutely engaging. Priest's writing style is just all around wonderful; she is an excellent writer. She balances out everything so well; description, action, world-building...every book I have read of hers so far is a joy to read and this book follows that trend. There is a ton of action scenes in this book and they are interesting action scenes; taking place on crashing dirigibles, speeding war trains, etc. This book ties in more with Boneshaker than Clementine (the 2nd book in the series did). We get to see some of the original characters from Boneshaker interacting with Mercy towards the end of the book and the mysterious things that Mercy uncovers on her journey west also coincide with some of the incidents that happened in Boneshaker. My only complaint with this book is that I thought Mercy's journey was a bit more drawn out than it needed to be and there were a couple parts of the book that got a bit slow for me. Because of this I liked both Boneshaker and Clementine slightly more than this book; still this book was a wonderful read. What do you get when you combine a bit of "Murder on the Orient Express", a dash of old Hammer Horror movies, a slightly larger dash of modern zombie sensibilities, a sizeable helping of movies like "Open Range" and "Tombstone", and generous portions of freshly sliced Steampunk? You get Dreadnought, the third book in Cherie Priest's ongoing "Clockwork Century" tale! And what a book it is! There's a bit of everything going on in this particular novel (except for romance), and it all adds up to a s What do you get when you combine a bit of "Murder on the Orient Express", a dash of old Hammer Horror movies, a slightly larger dash of modern zombie sensibilities, a sizeable helping of movies like "Open Range" and "Tombstone", and generous portions of freshly sliced Steampunk? You get Dreadnought, the third book in Cherie Priest's ongoing "Clockwork Century" tale! And what a book it is! There's a bit of everything going on in this particular novel (except for romance), and it all adds up to a sum greater than its parts. Action, adventure, sleuthing, horror, mystery, and a bit of North vs. South ruminations are all skillfully woven into a compelling narrative, with nurse Mercy Lynch smack in the middle of it. For this outing, the entire tale is told from one 3rd person perspective, that of the aforementioned Vinita "Mercy" Lynch. And honestly, it does the tale wonders. My gripe about the lack of character background in the previous novel has been thoroughly addressed here. By spending all our time with just the one character, we are allowed to learn that much more about her; her motivations, fears, hopes, and overall character. This made for a much more relateable heroine, and therefore a more enjoyable read. Mercy is naturally stubborn and brave, though she tends to surprise herself with latter at times. As a nurse, she's seen plenty of terrible wounds, but the horror elements she meets as the tale unfolds truly frighten and confound her. She is surrounded by various supporting characters that help flesh out the story, and to help propel her into various encounters and events that test her courage and her wits. From the gruff, stubborn and shrewd Texas lawman to the opinionated, but inquisitive and equally stubborn Miss Clay, Mercy is never lacking for interesting companions. As for the elements listed in the first paragraph, they are all here in roughly equal measure, and all seem to work equally well. The mysterious cargo that the train is transporting is handled well, though most readers will probably figure it out before the reveal. The action scenes are taut, vicious, and largely unpredictable. The missing Mexican troops are used to great effect, and the sense of urgency escalates as the "Dreadnought" gets closer and closer to its destination. The Utah scenes were also fun, simply by the virtue that I happen to live in Utah, so the locations are familiar to me. Though it started out somewhat slow, Dreadnought only got better and better as it went, culminating in a well deserved and very satisfying conclusion. And yes, characters from other books do make an appearance, in a way that isn't obtrusive or unbelievable. So prior reading of the previous books, while not mandatory, is HIGHLY encouraged. This review has been hidden because it contains spoilers. To view it, click here. There is something about train journeys. It isn’t just the “romance” of the journey, but the ability to sit back, relax and watch the word. You see and appreciate, the key here, the views and vistas that you pass by. Stories that take place on train journeys should capture some of this. Dreadnought, sadly, doesn’t. It wants to feel like one of those old Western train movies but it falls flat, in part because there is no real sense of urgency. The novel opens quite well with Mercy working in Clar There is something about train journeys. It isn’t just the “romance” of the journey, but the ability to sit back, relax and watch the word. You see and appreciate, the key here, the views and vistas that you pass by. Stories that take place on train journeys should capture some of this. The novel opens quite well with Mercy working in Clara Barton’s infantile Red Cross hospital during an everlasting American Civil War. She receives word that her estranged father wants to see her before he dies. It is this opening section with the hospital and treatment of the wounded that really shines. The characters are well defined and drawn. You care even about the wounded that appear for a brief time. Sadly this does not translate to the travel part of the book. In part, the reader keeps waiting for something to happen, even though things are happening. It is hard, difficult, to keep some of Mercy’s traveling companions straight. It just makes you want to watch a good Western or read Dreadful Skin. So why three stars? Well, really 2.5. Because despite the problems, the reader does like Mercy and Miss Clay, the only other character to stand out in Mercy’s journey. Furthermore, the idea of zombies being linked to drugs that runs in this series is worth it. Looks like I skipped the second book, but as each one focuses on a different character that doesn't seem to matter. 1. The explanation of how in the midst of this seemingly never-ending civil war, almost all the southern states had freed their slaves just seemed way off to me. I mean, I'm a w Looks like I skipped the second book, but as each one focuses on a different character that doesn't seem to matter. 1. The explanation of how in the midst of this seemingly never-ending civil war, almost all the southern states had freed their slaves just seemed way off to me. I mean, I'm a white dude from North Carolina, so I'd love to imagine that my state was just a hair away from freeing its slaves, but you know what? I can buy an army of (view spoiler)[zombie Mexicans (hide spoiler)] but I just can't buy that. Call me cynical, but it felt like a detail stuck in there to make it okay for people who hate slavery to enjoy this book, set during the civil war, and starring a southern character. It's not my alternate history, it's Cherie Priest's, but that was my reaction. 2. Regarding the aforementioned (view spoiler)[zombie Mexicans (hide spoiler)]: They just appeared out of nowhere because it was time for them to appear. Oh crap, we're four chapters from the end? Well, here they are. This is a very different book from the first two in the Clockwork Century series. This is a tight, fast paced, and narrow story about a nurse named Mercy making her way across a civil war torn country. Mercy is a strong and likable protagonist who is brave and good at her job as a nurse. She gets the news that her husband, whom she hs not been seen for over 2 years has died in a prison camp. Meanwhile, her estranged father has contacted her about needing to see her because he is on his death bed. This is a true steam punk novel and old style western about a very long train ride. The elements of war, the aspects of our civil war, and the strength of Mercy makes this novel work. I loved the first twenty percent that involved the crashed dirigible, crazy war machines, and injured leaders. I could read books like this all day, every day. The story, the writing, nd the characters make for really great escapism. My only gripe is that I did not want this one to end and would have welcomed a few hundred more pages. This review has been hidden because it contains spoilers. To view it, click here. Priest follows up on her novel of a steampunk Seattle infested by zombies with this journey across a war-torn continent. Nurse Mercy is a sympathetic and engaging character, and her hard won skills seem ever in demand as one disaster after another befall her. Her own divided loyalties put her in the crossfire of an extended Civil War over and over again. The pacing is brisk, the tension well-established, and many of the secrets she uncovers make a grim sense when considered in light of the previ Priest follows up on her novel of a steampunk Seattle infested by zombies with this journey across a war-torn continent. Nurse Mercy is a sympathetic and engaging character, and her hard won skills seem ever in demand as one disaster after another befall her. Her own divided loyalties put her in the crossfire of an extended Civil War over and over again. The pacing is brisk, the tension well-established, and many of the secrets she uncovers make a grim sense when considered in light of the previous novel. While the plot does not strictly require familiarity with the first book, Boneshaker, a lot of the details will not make much sense without it. Mercy may not know the source of the plague, but we do. The fate of the missing Mexican division takes on far more menace when you already know what has happened to them. And there's a bit at the end that I think was supposed to be a surprise, but because I'd forgotten some key character names (I read the last book a year ago), I didn't figure it out until several pages after I was supposed to understand. Without knowing (and caring about) the previous set of characters, the denouement would be baffling and pointless, despite none of those characters appearing until the last twenty pages. I very much enjoyed the experience of reading this book--it's quite entertaining--and I wanted to give it a higher rating than I did. But there are a number of gaping plot holes that I just couldn't get around. I still liked it, but it's rather unfortunately flawed. - The biggest question is why Mercy stays on the damn train to begin with. There's a bit of handwaving here and there, but really--she knows that they're a target, she knows she's going to be placed in an untenable position, and eventually she knows that she's driving into an area that's infested with ravenous undead that terrify and nauseate her. Almost everyone else gets off the train and is given alternate tickets to their respective destinations. Why doesn't she? I do realize that she's in a hurry because of her father--but the trains seem to run every few days. With a journey that takes weeks, would a few days really make that much of a difference, compared with the strong possibility of being shot by her own side, or shot as a spy by the people she's traveling with, or eaten? I also realize that she feels a vague responsibility to provide medical help, given that everyone she meets seems to have conveniently misplaced their doctors. But again, this doesn't seem to outweigh the fairly easy-to-see disaster barrelling down the track at her. She doesn't actually owe these people anything--the ranger is untrustworthy, the captain might well have her shot if he figures out what she is, the entire train is dedicated to a mission that hurts the Confederates, but the Confederates are bent on a course of action that will kill her. If she had wrestled with these and bravely chosen, I might be willing to concede the point. But instead, she just kind of goes along for undefined reasons. - Also, why are there never any doctors around, when they're supposed to be standard? Suspiciously convenient. - Why does no one know what happened to Seattle? I guess I can understand a random nurse on the front of a Civil War that's lasted 20 years not much caring about a disaster in a city on the other side of the continent. But you would think that if an entire city was turned into a disaster zone filled with ravening zombies nearly two decades ago, this should not be news to, say, the governments of Mexico or Texas. This isn't a minor disaster, this isn't a minor port city, and this isn't a week ago. There should have been plenty of time for the other countries to notice the problem, and it should not be a secret confined to a handful of scientists. You can't hide stuff like this. - What on earth was Theodora Clay doing on that train? I kept expecting her to turn out to be the spy, or at least a spy. Too much was made of her jerkish behavior and militant stances for her to just be a random passenger. - If they were so worried about the Shenandoah getting ahead of the Dreadnought and blowing the tracks...why didn't the Dreadnought blow the Shenandoah's tracks? I guess the railroad companies would be upset, but that didn't stop folks from shooting down a civilian dirigible earlier in the book. It's a war. Don't dump the cars, blow the damn tracks. 2.5 stars. I'm still not sure what the purpose of this book was. Not that every book has to have a purpose, but there must be something that drove the author to write it, even if merely for entertainment. The Dreadnought is full of wonderful descriptions and a well-laid out story; it just wasn't a very interesting story. It started off well, and I was ready and willing to go for a steampunk-inspired ride aboard a Union train in a Civil War Era America populated with machines, dirigibles, and ste 2.5 stars. I'm still not sure what the purpose of this book was. Not that every book has to have a purpose, but there must be something that drove the author to write it, even if merely for entertainment. The Dreadnought is full of wonderful descriptions and a well-laid out story; it just wasn't a very interesting story. It started off well, and I was ready and willing to go for a steampunk-inspired ride aboard a Union train in a Civil War Era America populated with machines, dirigibles, and steamboats. But 170 pages in and....not much had happened. Mercy's character, back story, and future plans were established, but all that could have been done in a mere 100 pages, and held my interest better. Finally she boards the train and I thought, now the fun will start! And for a while I was swept up in the secrets, possible conspiracies, Confederate/Union tensions, and the speckling of unique characters - the suspicious lawman, the charming captain, the nasty scientist, and the spunky seat-mate (a word I just made up), among others. But the potential found there just fizzled out. Much of this was due to Mercy. Mercy is solid, useful, and level-headed, but utterly uninterested in making any sort of connections with other individuals. I appreciate that she was different than a typical heroine - less emotional (fine), contentedly alone (I can dig that), but she was just too distant for me to truly like her. Why does she dislike the capable, clever Theodora but make friends with the two random "women of ill repute" who serve ZERO purpose to the story? Why spend time developing her relationship with the lawman, the captain, the porter, etc., if only to have her leave the Dreadnought at the end and never see any of them ever again? Why play up the mystery of the yellow sap and the half-dead people if all of us who have read the first book know exactly what's going on? There are some writers who speak directly to my thought patterns. I love the cadence of their writing, the storyline progression, concepts, characterizations. They write people that reflect a little bit of me – the way I see myself, or the way I want to see myself. Cherie Priest writes people. Yes, she writes zombies and dirigibles, soldiers, and poison gas... but she also writes deliciously complicated women, who are forced to live up to their potential, whether they want to do it, or not. And There are some writers who speak directly to my thought patterns. I love the cadence of their writing, the storyline progression, concepts, characterizations. They write people that reflect a little bit of me – the way I see myself, or the way I want to see myself. Cherie Priest writes people. Yes, she writes zombies and dirigibles, soldiers, and poison gas... but she also writes deliciously complicated women, who are forced to live up to their potential, whether they want to do it, or not. And maybe they're proud of what they accomplished, or maybe it's just the next thing that happened to them. She might tell us... or not. Dreadnought is an unusual story. Once again, we're visiting the Clockwork Century by means of an odyssey. Mercy Lynch starts her adventure because somebody asks her, she's tired of where she is at the moment, and she doesn't have a good reason to say no. In fact, she has only the barest of good reasons to say yes. Most of the time, I prefer my “for fun” novels to have a proportionate beginning, middle and end. Dreadnought is ALL middle. It has a beginning that's little more than a set-up, and a teeny little ending that gives us a teeny bit more ending for one of the characters in Boneshaker (yay!) but in this case, it just works. It's like one of the classic chase movies – Butch Cassidy and the Sundance Kid, The Great Train Robbery, or Cool Hand Luke. These are people who drift into quickly unfolding action, and they have to react. Maybe they change and grow, and maybe they don't, but things still happen. At the end you know they have to be changed, they just have to. And like the movies, you might want to know “what happened next,” (well, except for the part where some of the characters are dead, heh,) but still, there was an ending, and it was satisfying, kind of, and when is the next book coming? Dreadnought details the journey of a young Civil War Nurse from one coast of America to the other. As this is an alternate history, steam punk inspired book, this travel entails dirigibles, diesel or steam powered mecha, deadly armored trains, and zombies. The Civil War has been waged for 15 years in this universe, and was not, as you would have supposed, fought over Slavery, but State's Rights. I haven't read the other books in the series, and perhaps that's my mistake. The reason for the long Dreadnought details the journey of a young Civil War Nurse from one coast of America to the other. As this is an alternate history, steam punk inspired book, this travel entails dirigibles, diesel or steam powered mecha, deadly armored trains, and zombies. The Civil War has been waged for 15 years in this universe, and was not, as you would have supposed, fought over Slavery, but State's Rights. I haven't read the other books in the series, and perhaps that's my mistake. The reason for the long term duration of the Civil War is never explained, and slavery is never brought up until a hundred pages in when Nurse Mercy meets a black woman on a train. I felt that was a really glaring error and spoiled the first half of the book for me. Maybe it's too PC for me to expect any Civil War story to have black characters. I wasn't filled with awe, nor did I tremble with fear during the descriptions of these secret-weapon locomotives, because well, they're TRAINS. Blow up the track. Done. Although there's lots of action, and Nurse Mercy undergoes increasingly bizarre adventures, the book drags. The climax to the over arching mystery that follows Mercy through out her journey is as obvious as a freight train. Mercy is intelligent and spunky, but she doesn't seem to have much of a personality beyond her willingness to curse in extreme situations. And as there are no other consistent characters throughout her story, it's hard to care how the story will end. Everything that made Boneshaker such a great read -- intriguing setting, multiple storylines, engaging characters -- is weaved seamlessly into Dreadnought, but this time Cherie Priest takes her lead character, nurse Vinita "Mercy" Lynch, on an intense, cross-country journey that methodically reveals the much bigger canvas that is The Clockwork Century. And what a journey it is! Starting in Richmond, VA, the opening two chapters are as emotionally engaging as the first 10 minutes of Pixar's UP, in Everything that made Boneshaker such a great read -- intriguing setting, multiple storylines, engaging characters -- is weaved seamlessly into Dreadnought, but this time Cherie Priest takes her lead character, nurse Vinita "Mercy" Lynch, on an intense, cross-country journey that methodically reveals the much bigger canvas that is The Clockwork Century. And what a journey it is! Starting in Richmond, VA, the opening two chapters are as emotionally engaging as the first 10 minutes of Pixar's UP, introducing Mercy and her connection to Boneshaker, setting the stage for the adventures to follow, and quickly establishing her as another strong heroine who can stand alongside Briar Wilkes, Lucy O'Gunning and Miss Angeline. In some ways it's even more character-driven than Boneshaker as the overt steampunk elements are more deeply infused this time around, without ever fading so much as to be simple window dressing. It's a case study in balancing compelling world-building with strong characters and underlying themes, all in the service of telling an engaging story. I'm looking forward to even more stories in this setting, and I hope someone is working with Priest to expand it beyond books because The Clockwork Century is absolutely overflowing with transmedia potential. Hell, I'd like to LIVE there, but I'd settle for an RPG, some comics and short stories, and a good HBO series. ...Following up on such a successful first book is always challenging. I think Priest delivered an even stronger novel with Dreadnought. It combines the setting, steampunk elements and zombies that made the first novel such a fun read but also manages to expand the reader's view of her alternate history. It's one of those book that will keep you reading just because the excitement of the story never lets up. I liked Boneshaker a lot, I absolutely loved Dreadnought. I can't wait for the next Cloc ...Following up on such a successful first book is always challenging. I think Priest delivered an even stronger novel with Dreadnought. It combines the setting, steampunk elements and zombies that made the first novel such a fun read but also manages to expand the reader's view of her alternate history. It's one of those book that will keep you reading just because the excitement of the story never lets up. I liked Boneshaker a lot, I absolutely loved Dreadnought. I can't wait for the next Clockwork Century novel, Ganymede, which unfortunately for me, is not expected until the fall of 2011. I was listening to this book thinking as I was going along, "Oooh, that's the guy she ends up with, oh wait nope." Then, "No, I was wrong, this is the guy she ends up with." Nope, this is not a romance book at all unlike the first one and I didn't mind. I loved, loved, loved the ending. Can't wait to see what happens to them next! I am reviewing a copy provided by the publisher. Vinita Lynch is a nurse for the Confederate army (known as “Mercy” to her patients), working at Richmond hospital in Virginia with a relatively good reputation for keeping its patients alive. With such a high survival rate, it’s little reason she barely has time to rest, let alone consider the husband she hasn’t seen in over a year. An unexpected telegram with news of his death and a req I am reviewing a copy provided by the publisher. Vinita Lynch is a nurse for the Confederate army (known as “Mercy” to her patients), working at Richmond hospital in Virginia with a relatively good reputation for keeping its patients alive. With such a high survival rate, it’s little reason she barely has time to rest, let alone consider the husband she hasn’t seen in over a year. An unexpected telegram with news of his death and a request for her presence in Washington changes that. Washington is outside the bounds of the country—all wild territory still being claimed by frontier settlers. It’s the home of her estranged father who finds himself near death and calling for the daughter he abandoned long ago; it’s also far away from anything she’s ever considered home. With the fresh burden of widowhood falling awkwardly and strangely nightmarish on her shoulders, Mercy makes her way West. There will be an unforgettable dirigible flight, a mad train, a bizarre mystery, and the oddest combination of gun-slinging characters ready for roaring adventure to introduce Mercy to the new life she’ll lead in Seattle. Dreadnought is the third Clockwork Century book by Cherie Priest and, in my opinion, the most polished of the bunch. The writing is at its most acutely observational; the dialogue affects the most convincing variety of personalities from across young America; and the plot offers yet another adventure story that’s hard to put down. It’s a rollicking and dangerous train ride across the country, as much mystery as it is fantasy with shades of horror thrown in for fun. With references to both Boneshaker and Clementine, this latest installment in the series combines an intimate look at the Civil War and a portrait of early American diversity while continuing to gather a mixture of elements and components of previous novels to coalesce into a rather satisfying read. This isn’t just a suspenseful and exciting thriller, it also has characters with real heart and the kind of grit that serves them well in their roughened frontier and war-torn environment. The protagonist, Mercy Lynch, is brave, determined, and resourceful. Priest always writes the most interesting, competent, and intelligent female characters (I mustn't forget the enigmatic Theodora Clay)—writing from the point of view of a nurse means readers experience Mercy’s courageousness first hand. She may not like what has to be done, but she’s trained to be practical and deal with difficult situations with a firm calmness and reassuring, yet often times pragmatic perspective. It isn’t resignation that motivates her, but a desire to move forward (and this is a very transitory novel, but it’s the transition, the journey, that’s the most important). That kind of open, no-nonsense approach makes her a great protagonist against the rife suspicion and racism of the time. The attitude also serves her well as a hands-on heroine willing to do whatever needs doing, squeamish or not, when the need arises. As you can imagine in a Cherie Priest novel, it arises fairly often. Mercy faces one bad turn of events after another. A bad news telegram, a dirigible crash, a stay at an inn with a dangerous secret—a peaceful, if long train ride is just the thing she has to look forward to. Of course, this isn’t that kind of novel. Mercy just isn’t that lucky. She is, however, very good at surviving. Living in a country where the Civil War has been prolonged for a couple of decades sort of demands resilience. Having the kind of resolve that allows one to punch a zombie in the face on reflex definitely means Mercy has strong resilience. Suffice to say, reading how Mercy and her fellow passengers try to survive is every bit as riveting as the action itself. Knowing that zombies are somehow related to the plot doesn’t take away the feeling of giddy anxiety I had when the characters slowly cotton on to certain mysterious, unexplained events and begin piecing together a slow and measured portrait of what may or may not be happening aboard the Dreadnought. Normally the slower, more realistic timescale allowed to fictitious characters to grasp at the clues we, as readers, are staring so obviously in the face, would be a slow irritant. In the capable hands of Cherie Priest, the steady realization that dawns on Mercy between what’s on her train, how it affects other passengers, and what may lay ahead, is mixed in a very satisfying combination that juggles reactions in a way that’s both completely believable and within the scope of their characters. What I mean to say is, knowing what something like sap really does to addicts doesn’t take away the suspense of waiting for Mercy and others to figure it out for themselves. I wanted them to arrive at the truth (it’s vital to the plot structure as well), but I also utterly believe in these folks as individuals rather than just tools in a story. As such, I was pleased when they arrived at their own conclusions in ways quite natural to their characters. That connection between reader and character is one of the things Cherie Priest does marvelously in her writing. It’s one of the things that keeps me coming back to read more of her books, especially those in The Clockwork Century series. One last part of this book that impressed me so much, was how Priest managed race relations. She doesn’t dwell on the issue, but rather fills the narrative with the periodic suspicion and unflattering attitudes of other characters (like the tension between the train passengers and the Mexican officials aboard or the absurd protocol involved in helping a well to do former slave) without letting it overshadow the main plot of the story. Having race be within the scope of Priest’s tale, yet outside of the main focus allows Dreadnought to be something other than a Steampunk contemplation on period stereotyping and racism. It would be a completely different story otherwise. For the most part, the book series I have read progress the story from one book to another. I get that there are some series with the same character in different predicaments for each book, but jumping from one character to another in each different book is an interesting tactic. Of course, I’m somewhat guilty of this, as The Fluxion Trilogy focuses on different characters for each book. As far as I can tell, The Clockwork Century series also does this, even if the connections between the char For the most part, the book series I have read progress the story from one book to another. I get that there are some series with the same character in different predicaments for each book, but jumping from one character to another in each different book is an interesting tactic. Of course, I’m somewhat guilty of this, as The Fluxion Trilogy focuses on different characters for each book. As far as I can tell, The Clockwork Century series also does this, even if the connections between the characters are flimsy at best. Even so, the plot seemed to take a step backward from Boneshaker to Dreadnought. This is the second novel in a fun series that is a steampunk reimagining of the civil war. In this series, Priest draws a different map of America with Texas being it's own country and the North and South stop before West of Utah. The west is considered a vast wilderness. The North and South have been in an embittered civil war for generations. In this book, Mercy, who is a nurse in a southern hospital, receives a message that her estranged father is dying up west in Seattle. She leaves her job, This is the second novel in a fun series that is a steampunk reimagining of the civil war. In this series, Priest draws a different map of America with Texas being it's own country and the North and South stop before West of Utah. The west is considered a vast wilderness. The North and South have been in an embittered civil war for generations. In this book, Mercy, who is a nurse in a southern hospital, receives a message that her estranged father is dying up west in Seattle. She leaves her job, and begins the journey west to meet him. On this trip she encounters one crazy thing after the next. She discovers an enormous undercover secret weapon that the North is hoping to use to win the war. It's lots of fun, and the writing is pretty good too. Over the last two years I have had the pleasure of picking up the latest zombie/steampunk fusion by Cherie Priest as a birthday present to myself, and after reading this year's installment, Dreadnought, I can only hope that I'll be able to celebrate a few more birthdays with one of her books tucked under my arm. "Dreadnought" is a loose sequel to Priest's last book "Boneshaker," with the characters of the previous installment only showing up as we near the end if this chapter. Both books take pla Over the last two years I have had the pleasure of picking up the latest zombie/steampunk fusion by Cherie Priest as a birthday present to myself, and after reading this year's installment, Dreadnought, I can only hope that I'll be able to celebrate a few more birthdays with one of her books tucked under my arm. "Dreadnought" is a loose sequel to Priest's last book "Boneshaker," with the characters of the previous installment only showing up as we near the end if this chapter. Both books take place during the Civil War, though they are written in an alternative history in which both steampunk mechanicals and zombies exist. While the story in "Boneshaker" used the Civil War conflict as a fringe element to its story, "Dreadnought" plunks its characters right in the middle of the bloody conflict. Mercy Lynch is a nurse at a Confederate hospital in Richmond Virginia when Clara Barton (the founder of the Red Cross) comes with the news that Mercy's husband, who happens to have been fighting for the Union, has died in POW camp. Distraught, but too busy to be allowed to grieve, Mercy has no other plan than to keep on patching together the young men who survive long enough to end up on her care. But when word comes that her long absent father has become ill, and may not live, Mercy decides to undertake the incredibly dangerous cross-country journey to the West Coast to be reunited with her father. The only way to get across the war-torn countryside is by dirigible and boat, and once Mercy crosses the Mississippi she faces the even more daunting prospect of finishing her journey on the Dreadnought; a fearsome, armored, steam-powered war engine built by the Union that happens to be her only real means of getting across country in time to see her father. But the Dreadnought is more of a challenge than Mercy could ever have dreamed as she soon finds out that it is hauling a secret cargo that has brought it to the attention of the Confederacy -- which is bent on stopping the Dreadnought and stealing the mysterious cargo even if it means killing every civilian on board. There is a particular genius to combining steampunk with the Wild West and it's far-and-away my favorite aspect of "Dreadnought." There's something about a corset-wearing heroine with a pair of pistols on her hip, and her earthy view of the world, that tickles my fancy. Combined with the fast-paced setting of a speeding train, and a few zombies thrown in, and it's hard to go wrong. Yet, as good as the setting is, Priest really shines when it comes to creating her lead characters. Mercy Lynch is everything you'd hope for in a leading-lady from the Old West. She's smart and has just the right amount of sass to deal with the upper-crust as well as a curmudgeonly Texas Ranger. She inserts herself into the thick of things because she's the most capable person in the room-- though it should be noted that her curiosity also gets her into a fair amount of trouble. Mercy is also our eyes into a world of shifting values and obvious racial tensions, but Priest has a deft touch that doesn't ignore any topic while still avoiding any kind of preachiness. If I have any critique of "Dreadnought" (and I do have to give a slight edge to "Boneshaker" as the better book of the two) it's that the steampunk elements are not prominent enough throughout the book. The early chapters have just enough to keep the idea afloat with some unique war machines and the requisite trip in an airship, but the descriptions are not terribly detailed. The Dreadnought is intended to be the centerpiece of steampunk machinery as far as the story goes, but trains were not particularly unusual in the Old West and simply adding some formidable armor isn't quite enough to give it a proper steampunk feel. "Boneshaker" had the smaller, more intricate gadgets involving goggles and mechanical arms and I missed the detail this time around. Additionally I think a few of the supporting characters could have benefited from fuller back-stories, but overall the narrative doesn't really suffer as the dialog is brisk and clever and easy to connect to. Priest also does a good job of continuing the storyline involving the zombies, though the progression of that story moves significantly slower (in a good way) than what I've come to expect from this particular plot device-- which I like because it isn't allowed to overwhelm the story (no pun intended). "Dreadnought" is a worthy successor to the terrific "Boneshaker." I look forward to the continuing story of Mercy Lynch and the cast of characters that are re-introduced at the end of the book --- not to mention the great combination of the Wild West, steampunk and zombies that Priest has melded together in such a fun way. It definitely makes my list of recommended books. This is the second book in The Clockwork Century series, and it is just as good as the first one! This is a riveting read, with a formidable heroine, who against considerable odds, makes her way across a divided country, in search of the father who abandoned her when she was very young! This is also the story of creatures who were once men. They inhaled a gas called the Blight which changed them. And it is the story of people who come together on a train called Dreadnought which contains its own This is the second book in The Clockwork Century series, and it is just as good as the first one! This is a riveting read, with a formidable heroine, who against considerable odds, makes her way across a divided country, in search of the father who abandoned her when she was very young! This is also the story of creatures who were once men. They inhaled a gas called the Blight which changed them. And it is the story of people who come together on a train called Dreadnought which contains its own secrets! "But all the things we think we know about the folks who spawned us or raised us... well.... sometimes they're wrong, and sometimes what we've seen isn't all there is to know."